Terrestrial glaciation in the Russian Arctic has been subject to extensive research and there is a vast body of literature on this subject (e.g., Krenke, 1982; Koryakin, 1988; Govorukha, 1989; Kotlyakov, 1992). The area occupied by the Arctic glaciers is 56 188 km2 which accounts for 80 per cent of the total glaciated area in the FSU (Mass Balance of Arctic Glaciers, 1996). Glaciers of the Russian Arctic constitute an important glacial province alongside Greenland and the Antarctic. Mainly islands of the western and central sectors of the Arctic, which are under the influence of the North Atlantic, are glaciated and there are two centres of glaciation in the mainland Arctic: the Polar Urals and the Byrranga mountains (Figure 8.6). The bulk of the present-day glaciation in the Russian Arctic (about 99 per cent) occurs on Franz Josef Land, Novaya Zemlya, and Severnaya Zemlya. The ice caps of the Russian Arctic are warmer than the ice sheets of Greenland, the Antarctic, and the Canadian Arctic and although they have negative ice temperature, intensive melting occurs every summer and in individual seasons it accounts for more than 50 per cent of accumulation (Tarussov, 1992). Topography controls the formation of glaciers in the mainland mountains through the exposure of slopes to moisture-bearing air flows and accumulation of snow in sheltered localities. The intensity of glaciation increases with latitude and altitude due to the decreasing temperature and enhanced influence of the westerly flow. At Novaya Zemlya and Franz Josef Land, the long-term average accumulation rates increase from 100-130 mm a-1 at sea level to 350-500 mm a-1 in the central part of the ice caps. The rate of ablation, which on average is about 150 mm a-1, decreases with altitude (Krenke, 1982; Govorukha, 1970, 1989). Eastward and further inland glaciation is greatly reduced due to the increasing continentality of climate. Ice caps dominate many of the Arctic islands (Figure 8.6). At Franz Josef Land and Severnaya Zemlya, ice shelves develop as a continuation of the terrestrial ice cover feeding on ice flow from the above-lying caps. The floating outlets of ice caps protrude into the sea and serve as a source of icebergs. Satellite data have shown that icebergs that exceed two km in length form at Franz Josef Land, the largest glacier-derived icebergs observed in Northern Hemisphere outside Greenland waters (Dowdeswell et al., 1996). Being frozen into the sea ice, the largest icebergs drift for years across the Arctic Ocean. Most of Franz Josef Land is fully glaciated. Radar soundings have shown that the thickness of the ice cap ranges between 300 m and 450 m. Many of the outlet glaciers of the archipelago are of surging type which is particularly typical of Zemlya Vilcheka. Glaciers of surging type are characterized by an oscillating regime: short periods of rapid motion when their velocity may increase up to hundreds of metres per year alternate with longer periods of stability or temporary retreat (these changes are unrelated to climate). Severnaya Zemlya accommodates the most extensive ice caps. The largest are Akademii Nauk ice cap at Komsomolets island and Karpinsky and Vavilov ice caps at the island of Oktyabrskoi Revolutsii. Their heights range between 800 m and 950 m above sea level and thickness of ice cover is 800-900 m. These ice caps have gentle slope gradients not exceeding 5-10° and a lack of fissures in its central sectors. In all, there are 17 glacial systems on Severnaya Zemlya including ice caps, 99 outlet glaciers, 3 ice shelves, and 72 glaciers of combined type (Mass Balance of Arctic Glaciers, 1996). Ice caps on the islands of Ushakov and Victoria develop on a flat surface and have a characteristic dome-like shape. Although they cover the islands almost completely, their area and thickness are quite small. The ice cap at Victoria island is only 105 m thick while that of Ushakov island reaches 294 m. The greatest morphological diversity of glaciers is characteristic of Novaya Zemlya. A combined type of glaciation occurs here: most of the northern island is covered by an ice cap (complete ice cover), while alpine glaciation develops further south (mainly small cirque glaciers occur at the coast of Matochkin Shar Strait which separates the northern and the southern islands). The ice shield of the northern island, which is 413 km long and has a maximum width of 9 5 km and a total area of 19 330 km2, reaches 1100 m above sea level. It has 60 outlet glaciers, some of which reach the sea. Glaciers of the Polar Urals and the Byrranga mountains are of alpine type. There are 91 glaciers in all in the Polar Urals, situated mainly on the eastern lee side of the crest (Mass Balance of Arctic Glaciers, 1996): 48 glaciers are of cirque or cirque-valley type and 43 are slope glaciers. The cirque and cirque-valley glaciers dominate slope glaciers in area by a factor of three. Generally, glaciers occur in valleys with south-west to north-east orientation; their nourishment depends on the westerlies which transport snow and deposit it in the hollows. In the Byrranga mountains, there are 96 glaciers, mostly small cirque and slope glaciers (Govorukha, 1989). Valley glaciers dominate (22 km2 are covered by 28 glaciers) and the largest one is Neozhidanny glacier (4.3 km2). The recently published work by the Institute of Geography of the Russian Academy of Science, World Atlas of Snow and Ice Resources (Kotlyakov, 1997) and accompanying comments provide a wealth of information about glaciation in the Russian Arctic. Dynamics of ice cover is determined by a balance between ice accumulation in the feeding zone and ice loss in the ablation zone. An alternative method of evaluating glacier dynamics is through assessment of the altitude of the equilibrium line (ELA), an imaginary line dividing glacier into feeding and ablation zones. Rising ELA is indicative of a less active stage of glacier development while lowering ELA points to a more active stage. Figure 8.7 shows spatial variations in ELA across the Arctic. The lowest ELA indicates the most favourable conditions for the development of glaciation. There are significant local variations in ELA. For example, at Severnaya Zemlya its position changes from 600 m respectively in the south to 300 m in the north; at Franz Josef Land it varies between 300 m in the west and 200 m in the east of the archipelago. Together with topography, ELA controls the morphology of glaciation. At Novaya Zemlya, glaciation changes from alpine in the south to ice cap in the north in accord with decreasing ELA; at Franz Josef Land the thickness of ice cover increases eastwards. Similar variations are observed on Severnaya Zemlya, although the relationship between ELA and characteristics of glaciers is upset by the influence of the Taymyr peninsula. The dynamics of glaciers are controlled by the balance between winter input and summer losses of mass. This balance varies in response to climatic fluctuations. Climate change in the Arctic during the last millennium was dominated by the warm medieval climatic optimum, which lasted approximately between the 10th and the 13th centuries, the cold Little Ice Age, which continued roughly from the 15th to the end of the 19th centuries, and a subsequent warming of climate. These changes are reflected in the oxygen isotopic signals, related to temperature at the time of condensation of atmospheric water vapour; chemical composition of ice, related to the nature of air masses, and consequently, to temperature; and the number and thickness of refrozen melt layers, which are proportional to surface melting and provide an index of summer warmth. More recent changes can be evaluated from direct meteorological and glaciological observations. Geomorphological evidence and mapping and measuring glacier front fluctuations are another source of information. The isotopic, chemical, and stratigraphic analyses of ice cores were conducted for the glaciers of Franz Josef Land and Sevenaya Zemlya by the Institute of Geography, Russian Academy of Science and the Estonian Geological Institute. Core chronologies are more uncertain in the Russian Arctic than those for glaciers in other parts of the world due to a higher temperature of the Eurasian glaciers. Higher temperatures intensify melting and refreezing effects and these factors affect reliability of chronologies established from dating the ice cores. Analyses of ice cores obtained from the Vavilov and Akademii Nauk glaciers on Severnaya Zemlya confirm the broad pattern of climate change but also show high interdecadal and interannual variability (Vaikmyae and Punning, 1982, 1983; Savatyugin and Zagorodnov, 1987; Tarussov, 1992). The higher frequency fluctuations, such as an unusually warm event observed between 1790 and 1830, are related to changes in the atmospheric circulation (Lamb and Johnson, 1954). Oxygen isotope ratio and chlorine concentration recorded in ice cores from the Vavilov ice cap (Figure 8.8) inicate that in the past 120-140 years a rapid increase in temperature has been observed (Vaikmyae and Punning, 1982,1983; Tarussov, 1992). Similar signals have been obtained from the Academii Nauk ice cap showing that the 20th century was the warmest time in the last millennium (Savatyugin and Zagorodnov, 1987). Comparison with the results obtained for the Canadian Arctic and Spitzbergen shows that warming in the Eurasian Arctic began at the same time as in the North American Arctic (Hansen and Lebedeff, 1987) but earlier than in Spitzbergen (Tarussov, 1992). Changes in mass balance of glaciers have been extensively monitored and studied in the Russian Arctic since the 1920s and time series of mass balance are available for Franz Josef Land, Novaya Zemlya, and Severnaya Zemlya. Mass balance data have a relatively high interanuual variability but certainly glaciers of the Russian Arctic show no signs of building up. Consistently negative mass balance data have been reported for Franz Josef Land since the 1930s with a retreat of glacier margins at a rate of 13-16 m a-1 and a decrease in altitude of ice caps, leading to the degradation of outlet glaciers (Grosswald and Krenke, 1961; Grosswald and Kotlyakov, 1969) and this trend continued in the late 20th century (Mass Balance of Arctic Glaciers, 1996). Likewise, mass balance of glaciers at Novaya Zemlya and Severnaya Zemlya was mainly negative albeit small (Govorukha, 1989; Mass Balance of Arctic Glaciers, 1996). Recent changes in mass balance of the Arctic glaciers are discussed by Dowdeswell (1995) and Dowdeswell et al. (1997). Geomorphic evidence of the degradation of glaciers, such as retreat of ice cap margins and shrinking of outlet, valley, and hanging glaciers has been observed throughout the Russian Arctic during the first half of the 20th century. 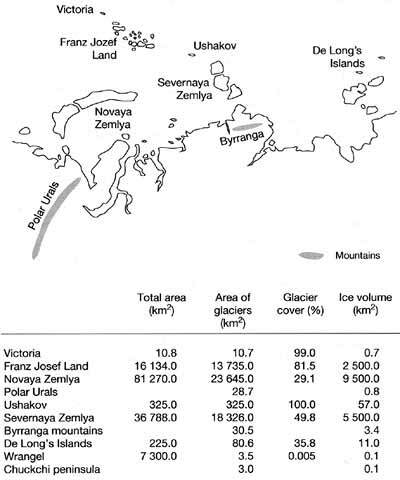 Observations on Novaya Zemlya between 1932 and 1952 indicated that the glaciated area has diminished by 430 km2 (2 per cent of the island's total) with the ice surface lowering at a mean rate of 250 mm a-1 (Chizhov and Koryakin, 1962; Koryakin, 1963). In coastal areas, deep and narrow fjords have been revealed following glacial retreat. In locations formerly occupied by valley glaciers, parallel rows of end moraines occur, indicating successive stages of ice cap shrinking. It was estimated that during the 20th century Novaya Zemlya has lost 700 km2 (or 5 per cent) of its glaciated area (Koryakin, 1986). Similar trends and evidence of deglaciation are observed at Severnaya Zemlya, Ushakov, and De Long's archipelago (Bolshiyanov and Verkulich, 1990; Govorukha et al., 1987). At Severnaya Zemlya, the area occupied by the Pioneer glacier shrank by 2 7 km2 (11 per cent of its area) between 1931 and 1978 and a total reduction in glaciated area of about 500 km2 occurred throughout the archipelago between 1931 and 1984 (Govorukha et al., 1987). At De Long's archipelago, a shrinkage of 80 km2 was observed in ice cover over the last 30-40 years (Verkulich et al, 1992). More intensive retreat of glaciers is observed at Franz Josef Land where ice mass decreased by 3.8 km3 a-1 (0.3 per cent of the total volume) between the 1930s and 1950s, with a mean rate of ice surface lowering of 270 mm a-1 (Grosswald and Krenke, 1961). Comparison of aerial photographs obtained in the 1950s and recent satellite imagery suggests a maximum retreat of 2-3 km (Dowdeswell, 1995). There is a good correlation between oxygen isotope composition and temperature and chlorine (Cl-) composition and temperature. The oxygen isotope composition in ice cores is given as deviations (б18O) from the Standard Mean Ocean Water (SMOW). High values of б18O in ice cores correspond to higher temperatures. 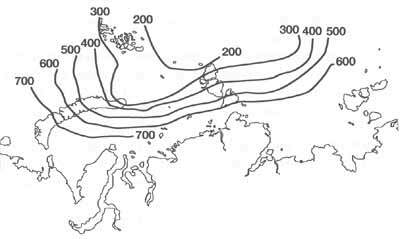 Concentration of Cl- is higher in the marine air masses, the occurrence of which depends on the extent of sea ice. Sea ice extent is higher during the cold periods leading to low concentrations of Cl- in the air and lower deposition: low concentrations of Cl- indicate lower temperatures. The imperfect relationship between б18O and Cl- profiles is due to the uncertainties in dating. Fig. 8.8 Oxygen isotope ratios related to temperature obtained from dating the ice cores of the Vavilov ice cap, Severnaya Zemlya. After Vaikmyae and Punning (1983). There is widespread geomorphological evidence of glacier retreat since the end of the Little Ice Age. Near-zero or negative values of mass balance show that the glaciers respond to the recent climatic warming and increase in precipitation. However, as Dowdeswell (1995) states: 'Predictions of the possible future response of the high Arctic ice masses to environmental change should be set within the context of continuing climatic variability which is not forced exclusively by anthropogenically induced changes to the atmospheric system, as exemplified by the direct and proxy records of climate change for the last few hundred years from the high Arctic'.